One week is devised for those who’ve completed the 3 levels of CRI Landscape. Only those are eligible to take part in this exciting week. Seascape is a very exciting week and is taught by Ellen Tye from USA. Ellen has a wonderful program that gives the possibility and ability to be included in workshops for those wishing to do so. 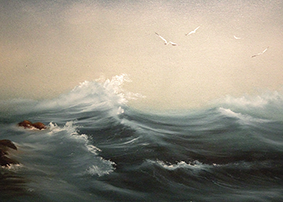 The landscape paints are used as also the landscape brushes to give spectacular paintings with the full movement of the ocean whether be it calm or stormy. Supply lists are sent out with the registration papers and can be ordered for delivery in class at heavily discounted rates.